Endocannabinoids provide control over cortical neurotransmission. We investigated the developmental expression of key genes in the endocannabinoid system across human postnatal life and determined whether they correspond to the development of markers for inhibitory interneurons, which shape cortical development. We used microarray with qPCR validation and in situ hybridisation to quantify mRNA for the central endocannabinoid receptor CB1R, endocannabinoid synthetic enzymes (DAGLα for 2-arachidonylglycerol [2-AG] and NAPE-PLD for anandamide), and inactivating enzymes (MGL and ABHD6 for 2-AG and FAAH for anandamide) in human dorsolateral prefrontal cortex (39 days - 49 years). CB1R mRNA decreases until adulthood, particularly in layer II, after peaking between neonates and toddlers. DAGLα mRNA expression is lowest in early life and adulthood, peaking between school age and young adulthood. MGL expression declines after peaking in infancy, while ABHD6 increases from neonatal age. NAPE-PLD and FAAH expression increase steadily after infancy, peaking in adulthood. Stronger endocannabinoid regulation of presynaptic neurotransmission in both supragranular and infragranular cortical layers as indexed through higher CB1R mRNA may occur within the first few years of human life. After adolescence, higher mRNA levels of the anandamide synthetic and inactivating enzymes NAPE-PLD and FAAH suggest that a late developmental switch may occur where anandamide is more strongly regulated after adolescence than earlier in life. Thus, expression of key genes in the endocannabinoid system changes with maturation of cortical function. The output of principal cortical neurons is regulated by a network of inhibitory interneurons [1, 2]. Coordinated development of these neurons underlies the acquisition and adaptation of visual, motor and cognitive function throughout postnatal life. Cognitive development during critical periods such as toddlerhood and adolescence is characterised by rapid acquisition of executive functions such as language, goal-directed behaviour and working memory [3–5]. This development is subserved by processes that facilitate a balance between excitatory and inhibitory transmission such as synaptogenesis [6–8], maturation of inhibitory interneurons , development of GABA receptors [10–12] and an early-life switch from excitatory to inhibitory actions of GABA [13–15]. The endogenous cannabinoid (endocannabinoid) system modulates excitatory-inhibitory balance by mediating short- and long-term synaptic plasticity. Cannabinoid CB1 receptors (CB1R) are thought to be primarily localised to presynaptic terminals of inhibitory GABAergic interneurons that express the neuropeptide cholecystokinin (CCK) and target the soma or proximal dendrite of pyramidal neurons in the primate dorsolateral prefrontal cortex (DLPFC) and primate and rodent hippocampus [16–18]. In addition, CB1Rs have been shown to co-localise with the calcium-binding proteins calbindin and calretinin in distinct subsets of cortical inhibitory interneurons [16, 18–20]. CB1Rs are also localised to some principal neurons in the hippocampus and the cerebellar cortex [21–23], although the current consensus is that they are expressed at much lower levels on these cells than in inhibitory interneurons . While endocannabinoids signal via a number of other receptors in addition to CB1, the major mode by which they interact with CB1Rs is via retrograde signalling. Following membrane depolarisation, increased Ca2+ concentration or metabotropic glutamate receptor activation, endocannabinoid ligands are synthesised in the postsynaptic terminal. Postsynaptic release and retrograde diffusion of endocannabinoids results in presynaptic CB1R activation and suppression of neurotransmitter release from presynaptic [20, 26–31] and, indirectly, from postsynaptic terminals . Biosynthesis of one major endocannabinoid, anandamide, from membrane phospholipid precursors is catalysed by several enzymes. The most well-studied of these, which we measured the encoding mRNA for here, is N-acylphosphatidylethanolamine-specific phospholipase D (NAPE-PLD; [33, 34]), but others include glycerophosphodiesterase (GDE1) , abhydrolase domain 4 (ABHD4)  and the phosphatase PTPN22 . Formation of the other major endocannabinoid, 2-arachidonylglycerol (2-AG), is catalysed by alpha and beta diacylglycerol lipases (DAGL) . Fatty acid amide hydrolase (FAAH) catalyses postsynaptic anandamide breakdown [39, 40] while 2-AG activity is terminated by both presynaptic monoglyceride lipase (MGL) and the postsynaptic abhydrolase domain 6 enzyme (ABHD6) [41–45]. Together, these elements of the endocannabinoid signalling system regulate early nervous system development (i.e. neuroblast migration , pyramidal cell specification , interneuron migration  and axon guidance [49–51]) and synaptic plasticity [29, 52], and thus would also be expected to sculpt behavioural and cognitive development. It is thus critical to determine the normal developmental trajectory of the endocannabinoid system, in humans and to determine which elements may be changing during critical periods such as adolescence, when the majority of cannabis use commences and which may be a period of vulnerability to the detrimental effects of cannabis exposure [53, 54]. Indeed, earlier age of cannabis use onset is associated with higher risk of psychotic symptoms and neuroanatomical abnormalities associated with psychosis [55–58]. However, while brain region-dependent increases and decreases in CB1R binding density and distribution between prenatal, infant and adult humans have been described [59–62], detailed studies of human endocannabinoid system development, particularly in the frontal cortex, are lacking. The aim of the present study was therefore to extend these earlier findings, using gene expression analysis to describe the development of CB1R and some of the major endocannabinoid metabolic enzyme mRNAs in human DLPFC across postnatal life. Given the localisation of CB1Rs to CCK-, calbindin- and calretinin-positive interneurons, we hypothesised that the trajectory of cortical CB1R development would partially correspond to those previously determined for these interneuron marker mRNAs in the same subjects . Expression of housekeeping gene mRNAs did not change significantly over the lifespan, nor did the geometric mean of the expression for all four housekeeping genes (Additional file 1: Figure S1). Microarray analysis revealed a significant decrease of approximately 50% in CB1R mRNA (probeset 213436_at) across the human lifespan (r = −0.779, p < 0.001, Figure 1A). Expression decreased from a peak in neonates to a plateau from toddler age until adolescence, and then further decreased to adult levels. qPCR data showed that CB1R mRNA decreased across postnatal life and correlated with RIN (r = 0.458, p < 0.001) and PMI (r = .337, p < 0.01) (ANCOVA, F = 5.5, df = 6, 47, p < 0.001, Figure 1B). Post-hoc LSD tests showed that CB1R mRNA peaked in toddlers and was lower in the adult group than in all other earlier age groups except young adults (see Figure legend for other group comparisons). CB 1 R mRNA in developing human DLPFC determined by (A) microarray (y-axis, arbitrary units in log scale) across age (x- axis, log years) and (B) qPCR [y-axis, mean (+ S.E.M.) expression normalised to the geometric mean of four housekeeping genes] plotted by age group. * P <0.05, ** P <0.01, *** P <0.001 (ANCOVA and post-hoc LSD). By in situ hybridisation we found a distinct laminar pattern of CB1R mRNA hybridisation signal in the grey matter, although scattered CB1R mRNA-positive signal was also found below the cortex in the white matter (small arrows, Figure 2). In the grey matter we found a dark band of increased CB1R mRNA immediately sub-adjacent to layer I, corresponding to layer II (large arrowheads, Figure 2). Another more diffuse band of increased CB1R mRNA signal was found in deeper cortical layers corresponding to layers V and VI, the width and intensity of which appeared to vary with age. There was no hybridisation detectable above background in sections incubated with the sense strand riboprobe (Additional file 2: Figure S2). Overall, in situ data indicated that CB1R mRNA expression decreased with age, particularly in the superficial cortical grey matter. Analysis of optical density of films generated from in situ hybridisation indicated that in all age groups, CB1R mRNA expression was highest in the supragranular cortical layer II (main effect: cortical layer F(5, 205) = 15.1, p < 0.001; simple contrast of layer II vs all other layers p < 0.001; Figure 3). Expression was highest in neonates and infants and lowest in adults, and these differences were statistically significant in layers II, III, V and VI (main effect: age group F(6, 41) = 2.54, p < 0.05; interaction effect: cortical layer x age F(30, 205) = 1.80, p < 0.01). Some layer-specific variation in the developmental pattern was evident. For example, in superficial layers II and III the school age group showed less pronounced reduction in CB1R mRNA density than in other layers; and in layer III only, teenagers showed significantly higher CB1R mRNA expression than both toddlers and adults. Silver grain clusters with a scatter diameter of 8–12 μm, representing the density of CB1R mRNA per cell, were visible 4–5 times above background levels on small interneuron-like cells in layers II, III, IV and VI (large arrowheads, Figure 4A – D). Clusters with a scatter diameter of 10 - 16 μm were visible on larger cells in layers III, V and VI (small arrows, Figure 4E - H). Representative autoradiograms of CB 1 R mRNA hybridisation in each age group of the developing human DLPFC. Large arrowheads: CB1R mRNA signal in layer II; small arrows: scattered signal in white matter. Mean CB 1 R mRNA expression in each layer (I – VI) of the developing human DLPFC. Data represent mean (+ S.E.M.). n = 5 – 13. * P <0.05, ** P <0.01, *** P <0.001 vs. neonate, # P <0.05, ## P <0.01 vs. infant, ^ P <0.05 vs. teenage (post-hoc LSD). High power brightfield photomicrographs of CB 1 R mRNA positive cells/nuclei in layers II (A – D) and V (E – H) of the human DLPFC. CB1R silver grains (black dots) appear on small interneuron-like cells (large arrowheads) and larger pyramidal neuron-like cells (small arrows). Scale bar = 10 μm. Expression of CB1R mRNA, as measured by qPCR, was positively correlated with expression of mRNA for the interneuron markers calbindin (r = 0.526, p < 0.001) and calretinin (r = 0.359, p = 0.01; Figure 5A - B). There was no correlation between CB1R and CCK mRNA (r = 0.082, p > 0.05; Figure 5C). Significant correlation of CB 1 R mRNA expression with mRNA for the interneuron markers calbindin (A) and calretinin (B), but not cholecystokinin (C). 2-AG synthesising enzyme mRNA (DAGLα) and hydrolysing enzyme mRNAs (MGL and ABHD6) show dynamic, divergent patterns across postnatal life. Microarray analysis revealed a gradual increase in DAGLα expression (probeset 214128_at) from low neonate levels to a peak at young adulthood (r = 0.409, p < 0.01, Figure 6A). qPCR data indicated that DAGLα expression was significantly correlated with pH (r = 0.319, p < 0.05). However, due to variability and limited n, subsequent ANCOVA results showed that DAGLα expression approached, but did not reach a statistically significant change across development with our chosen primer and probes (F = 2.0, df = 6, 48, p = 0.08, Figure 6B). Based on microarray results, planned post-hoc LSD tests carried out on the qPCR expression data showed that compared with both neonates and adults, DAGLα mRNA expression was increased in toddlers (p < 0.05), school age (p < 0.01) and teenage individuals (p < 0.05), indicating a peak at school age. 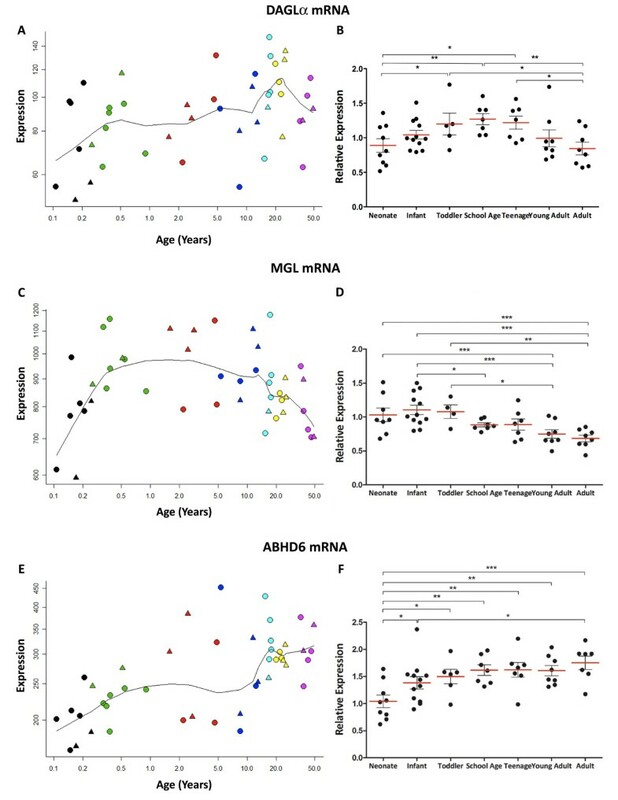 DAGLα, MGL and ABHD6 mRNA in developing human DLPFC determined by microarray (A, C, E; y-axis, arbitrary units in log scale) across age (x- axis, log years), qPCR [B, D, F; y-axis, mean (+ S.E.M.) expression normalised to the geometric mean of four housekeeping genes] plotted by age group. * P <0.05, ** P <0.01, *** P <0.001 (ANOVA/ANCOVA and post-hoc LSD). MGL mRNA expression (probeset 211026_s_at) was quite variable in the microarray, showing an inverted U-shaped pattern across the human lifespan with a rapid increase until 6 months of age and then a steady decline starting after age 10 (quadratic regression p < 0.05, Figure 6C). qPCR analysis confirmed the developmental downregulation of MGL mRNA expression with age (ANOVA, F = 5.1, df = 6, 47, p < 0.001, Figure 6D), and post-hoc LSD tests showed that MGL expression was significantly reduced from infant levels by school age and continued to decrease from school age until adulthood. However, qPCR data failed to confirm the early increase in MGL mRNA from neonates to infants, suggesting that the prominent pattern was one of decline. Microarray analysis showed that ABHD6 mRNA expression (probeset 45288_at) increased during human maturation by around 50% (r = 0.627, p < 0.001, Figure 6E). By qPCR, we saw a similar pattern, but we detected a steady increase in ABHD6 mRNA expression over postnatal development and maturation by qPCR, with a plateau from school age to young adulthood followed by an increase to adult levels [ANCOVA, F = 4.1, df = 6, 49, p = 0.002, Figure 6F; ABHD6 mRNA correlated with pH (r = 0.416, p = 0.001)]. Post-hoc LSD tests showed increased ABHD6 mRNA expression in all age groups compared with neonates, and in adults compared with infants (p < 0.05). Microarray analysis revealed a steady and large increase of almost 300% in NAPE-PLD mRNA expression (probeset 226041_at) from the neonate to adult groups (r = 0.959, p < 0.001, Figure 7A). By qPCR, we confirmed that NAPE-PLD mRNA expression increased steadily across development [ANCOVA, F = 6.8, df = 6, 45, p < 0.001, Figure 7B; correlated with PMI (r = −0.367, p < 0.001)]. Post-hoc LSD tests showed that compared with neonates NAPE-PLD mRNA expression was significantly increased in later life, from an 87% rise in toddlers to a 106% increase in adults. 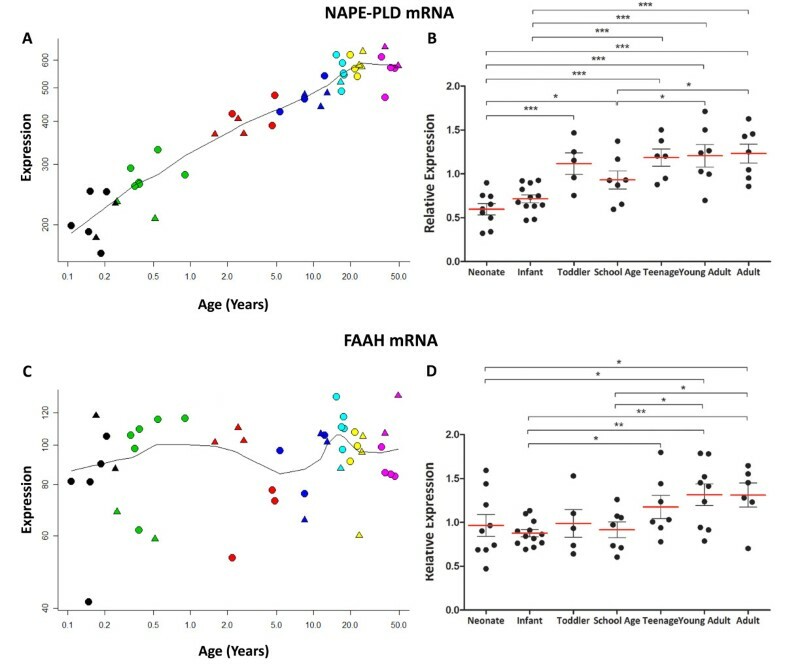 NAPE-PLD and FAAH mRNA in developing human DLPFC determined by microarray (A, C; y-axis, arbitrary units in log scale) across age (x- axis, log years) and qPCR [B, D; y-axis, mean (+ S.E.M.) expression normalised to the geometric mean of four housekeeping genes] plotted by age group. * P <0.05, ** P <0.01, *** P <0.001 (ANOVA/ANCOVA and post-hoc LSD). FAAH mRNA expression (probeset 204231_s_at) was not altered across development in the microarray (r = 0.258, p = 0.09, Figure 7C). qPCR data indicated, however, that FAAH mRNA expression increased over the lifespan (ANOVA, F = 3.0, df = 6, 48, p = 0.02, Figure 7D), with post-hoc LSD tests showing that FAAH mRNA increased by 36% from neonates to young adulthood (p < 0.05). Here, we present evidence for dynamic and non-concomitant changes in expression of mRNA for the CB1R and the metabolic enzymes for its major ligands during key epochs of human postnatal development (Figure 8). During early postnatal life (the period from neonate to toddlerhood), CB1R mRNA peaks in the DLPFC. Expression of the 2-AG synthetic (DAGLα) enzyme and the pre- and postsynaptic hydrolytic 2-AG enzymes MGL and ABHD6 begins to increase. Expression of one of the anandamide synthetic enzymes NAPE-PLD also increases steadily during early life while mRNA for FAAH, the anandamide hydrolytic enzyme, remains stable. At adolescence, CB1R mRNA is in decline compared with early life, particularly in cortical layer II. At this time, MGL has begun to decline while ABHD6 mRNA is increasing, compared with early postnatal life, suggesting an increased capacity for regulation of postsynaptic 2-AG release. The potential for anandamide turnover may increase in adolescence relative to earlier life given the rise in NAPE-PLD and, to a lesser extent, FAAH mRNA. By adulthood, CB1R mRNA is significantly reduced from early life levels, suggesting attenuation of control over synaptic neurotransmission mediated by this receptor, coincident with maturation of cognitive function. In contrast, the capacity for enzymatic control of anandamide turnover may continue to rise in adulthood, indicated by high mRNA expression of both NAPE-PLD and FAAH. Expression of mRNA for endocannabinoid receptor and metabolic enzymes across development. qPCR data in our tissue cohort are represented schematically in the context of an inhibitory DLPFC synapse. Note that the size of each coloured mRNA reflects the relative magnitude of expression at different developmental points, not absolute mRNA levels. Arrow thickness represents relative prominence of signalling or enzymatic breakdown at each point. A Early life (neonate to toddler age) is characterised by robust potential for endocannabinoid modification of presynaptic neurotransmission (suggested by moderate 2-AG synthesis, low levels of postsynaptic 2-AG hydrolysis, high CB1R mRNA and low anandamide synthesis). B Adolescence is represented by increased potential for endocannabinoid modification of presynaptic input (suggested by elevated 2-AG synthesis), but reduced potency of such endocannabinoid modification compared with early life (reflected by reduced CB1R mRNA and increased anandamide synthesis). C By adulthood, modification of presynaptic neurotransmission by endocannabinoids may be minimal: despite reduced presynaptic 2-AG hydrolysis, there may be reduced capacity for retrograde 2-AG signalling due to reduced postsynaptic 2-AG synthesis and increased postsynaptic 2-AG hydrolysis, and CB1R mRNA is reduced. Anandamide turnover peaks at adulthood, suggesting increased prominence in signalling at CB1R or other receptors such as TRPV1. In situ hybridisation allowed us to determine the laminar distribution of CB1R mRNA in the DLPFC. CB1R mRNA is highest in cortical layer II in individuals aged from one month to 50 years. We observed silver grains indicative of CB1R mRNA expression densely clustered over small, interneuron-like cells in layers II, III, IV and VI and more sparsely collected over larger cells in layers III, V and VI. CB1Rs in primate DLPFC are primarily localised on CCK-positive inhibitory interneurons , but are also co-localised with the calcium binding proteins calbindin and calretinin in distinct subsets of cortical inhibitory interneurons [16, 18–20]. We did not observe a correlation between CB1R and CCK mRNA, which increases steadily from neonatal age to adulthood . However, CB1R mRNA expression was correlated with both calbindin, which follows an inverted U-shaped trajectory , and calretinin, which is highly expressed early in human development . However, since CB1R , CCK [63, 64] and calbindin mRNA  have been detected in pyramidal neurons, expression data may reflect heterogeneous origins of the mRNA signal, such as in layer V, which contains both pyramidal neurons and wide arbor interneurons. Further studies quantifying CB1R mRNA on specific cell types are necessary to resolve the developmental expression patterns of CB1R in specific interneuron types. Peak CB1R mRNA expression was observed at neonatal age by microarray but in toddlers by qPCR, a discrepancy that may arise from the differential preference for 3’ versus 5’ transcript detection between the two techniques. Laminar analysis of in situ hybridisation indicated that CB1R mRNA expression peaks in neonates and infants in most cortical layers. These findings are confirmed by recent data from a different study showing a similar trajectory from early life to adulthood, with CB1R mRNA peaking at neonatal age then decreasing until adulthood . The robust decrease in CB1R mRNA expression in layer II from early life to adulthood in our human cohort agrees with previous findings in primate  and suggests strong regulation of neurotransmission by CB1Rs early in life (Figure 8). It is tempting to speculate that this CB1R down-regulation results in a gradual reduction in CB1R-mediated suppression of inhibitory presynaptic neurotransmission. Indeed, the first putative drop in CB1R mRNA expression in layer II occurs around the toddler/school age group, which represents a period of increased inhibitory control in the prefrontal cortex marked by dynamic changes in inhibitory interneuron marker expression  and increased working memory ability . The shape of the postnatal trajectory of DAGLα mRNA suggests that the capacity for synthesis of 2-AG, the major cortical endocannabinoid, increases during early postnatal life. In early life, 2-AG synthesis is also catalysed by the beta isoform of DAGL, but since expression of this isoform may decrease very early in postnatal life  it was not measured in the present study. 2-AG tone is principally regulated by the presynaptic hydrolytic enzyme MGL , which showed reduced mRNA expression over postnatal life after peaking in infancy, and also by the postsynaptic enzyme ABHD6, expression of which increased steadily from neonatal age to adulthood. In early development, MGL co-localises with CB1Rs in presynaptic terminals of developing cortical pyramidal neurons in order to regulate corticofugal axon fasciculation . Thus the role of MGL in controlling 2-AG availability may diminish once appropriate cortical-origin connections are in place. Our results suggest that the major endogenous ligand acting on the CB1R, 2-AG, may be somewhat unstable early in human life due to quite high variability in mRNA controlling synthesis and breakdown within individuals less than 5 years of age. We suggest that 2-AG may be especially influential and subject to increased regulation in early postnatal life when the CB1R and presynaptic breakdown enzyme for 2-AG are at developmentally high levels. By adolescence there is a significant decrease in CB1R expression, suggesting an overall decrease in sensitivity to the effects of released endocannabinoids on neurotransmitter release. At this age, working memory performance reaches near adult levels with concomitant increases in DLPFC activity recruitment [4, 5]. However, at adolescence, DAGLα has not started to decline and MGL mRNA has just begun to decrease, while ABHD6 mRNA continues to increase, suggesting that capacity for 2-AG hydrolysis in pre- and postsynaptic compartments may be anatomically balanced at this age. Thus, maintaining the earlier steady-state levels of 2-AG, while incorporating more temporal/spatial control of 2-AG action in the face of CB1R down-regulation, may be important during adolescence. This is an intriguing possibility and agrees with the increasing endocannabinoid-mediated suppression of neurotransmitter release observed in postnatal rat hippocampus until early adolescence . Taken together, our data imply that the capacity for 2-AG signalling remains fairly steady between early postnatal life and adolescence then may decline. The gradual increase in expression at adolescence of the mRNA for anandamide hydrolytic enzyme FAAH, which is localised postsynaptically , suggests that at this point there is increased potential for control over the timing of anandamide availability for signalling at CB1R as well. CB1R mRNA continues to decline until young adulthood, when individuals have attained mature levels of inhibitory control over cortical excitability. Combined with the early life increase in DAGLα and its decline in adulthood (compared with toddlerhood, school age and adolescence), our data is broadly consistent with previous work in the rat indicating that 2-AG is higher earlier in postnatal life and declines with maturation . As maturation progresses the decline in DAGLα and MGL and increase in ABHD6 mRNA reflect the potential for reduction in the amount of 2-AG available for release from the postsynaptic terminal as compared with early postnatal life (Figure 8). Combined with reduced CB1R expression at the same age, reduced 2-AG availability after adolescence might ‘release’ the endocannabinoid-mediated suppression of presynaptic neurotransmission to allow greater inhibitory input to cortical circuitry. Our data suggest an overall increase in the capacity for anandamide synthesis via the NAPE-PLD pathway during development and maturation of the human DLPFC. Neonatal NAPE-PLD expression levels increase threefold by adulthood, extending to humans previous findings of increased cortical NAPE-PLD mRNA expression from postnatal day 14 to 56 in rats  and suggesting that, as in rat brain, anandamide synthesis may be higher in maturity than in early life . There are several possible functional implications of these observations. Anandamide induces long-term depression of inhibitory synapses via transient receptor potential vanilloid 1 (TRPV1) receptors in hippocampus, striatum and developing midbrain [71–73], and since TRPV1 receptors are expressed cortically  it is possible that anandamide facilitates excitatory neurotransmission in this region in a similar manner to its effects in the hippocampus. However, if this were the case, then increased anandamide signalling would be expected to result in decreased, rather than increased inhibitory tone as maturation proceeds. On the other hand, anandamide opposes striatal 2-AG signalling by down-regulating 2-AG production , suggesting the possibility that increased NAPE-PLD expression results in greater synthetic capacity for anandamide production and consequent down-regulation of 2-AG production towards adulthood. Finally, our data must be interpreted carefully in light of the other enzymatic pathways for anandamide synthesis, including GDE1, ABHD4 and PTPN22. Future studies will benefit from investigating the postnatal developmental expression of these mRNAs. Overall, our data show that human early postnatal life, adolescence and adulthood are characterised by distinct differences in capacities for endocannabinoid synthesis, breakdown and receptor expression, which we summarise in Figure 8. While the varying circumstances surrounding death and variable post-mortem intervals are limitations of using human brain material, these factors did not appear to obscure the major impact of age on endocannabinoid system mRNAs nor did they have a major impact on the measurements in our study. Our findings may help to identify pathophysiological mechanisms in developmental disorders characterised by compromised cortical inhibitory function such as schizophrenia [9, 11, 76, 77] and autism . For example, disruption of this dynamic postnatal maturation by exogenous cannabinoid exposure might impact processes such as cortical network oscillations, which are governed by inhibitory interneuron activity and coordinate behavioural processes such as discrimination during decision-making  and have been reported to be susceptible to suppression by CB1R agonists [79, 80]. Importantly, since adolescence is the most likely period of commencement of cannabis use, our findings emphasise the need to determine how exposure to exogenous cannabis constituents such as THC during this period affects the changes in the endocannabinoid system and its role as a gatekeeper of neurotransmission. Tissue from the middle frontal gyrus of 69 cases aged 39 days to 49 years was obtained from the University of Maryland Brain and Tissue Bank for Developmental Disorders (NICHHD contract no. NO1 = HD8-3283) following informed consent from next of kin. This study was carried out in accordance with the latest version of the Declaration of Helsinki after review by the University of NSW Human Research Ethics Committee (HREC #07261). Cases were grouped and labelled according to age, and demographic details of this cohort (Table 1) have been described previously . RNA isolation, quality assessment, microarray and qPCR analyses were conducted following established protocols . Total RNA was extracted for microarray and qPCR analysis from 300 mg gray matter using Trizol (Invitrogen, Carlsbad, California) according to the manufacturer’s instructions . The quality of total RNA was determined using the Agilent Bioanalyzer 2100 (Agilent Technologies, Palo Alto, California). 100-200 ng RNA was applied to an RNA 6000 Nano LabChip, without heating prior to loading. The RNA integrity number (RIN) was used as an indicator of RNA quality, ranging from 1 – 10 (lowest - highest quality). Six samples were excluded with RIN <5.2. Cases did not differ significantly within each age group according to brain pH or RIN. Total RNA (n = 45) was purified through Qiagen RNA miniKit columns (Qiagen Inc, Valencia, California) according to the manufacturer’s protocol. Purified total RNA was then prepared according to the Affymetrix protocol http://www.affymetrix.com] and hybridised to HG-U133 version 2.0+ (GeneChips, Affymetrix California). Hybridised arrays were subjected to rigorous quality control including analysis of 5’:3’ ratios (included range 0.40-0.79), percent present (included range 37 - 47%), average pair-wise correlation analysis and principal component analysis, resulting in the exclusion of 3 individuals. Affymetrix Microarray Suite (MAS 5.0) and the Bioconductor package were used for image processing and data normalisation respectively. Probe sets that were 50% present in at least one of the age subgroups were retained in the analysis (33,210 probe sets retained; 61% of total number). Microarray data are available in the Gene Expression Omnibus archive under series accession number GSE13564. Results from the microarray experiment were confirmed using qPCR (n = 61). cDNA was synthesised in 3 reactions of 3 μg of total RNA using the Superscript First-Strand Synthesis Kit (Invitrogen) according to the manufacturer’s protocol. Pre-designed TaqMan Gene Expression Assays (Applied Biosystems, Foster City, California) were chosen for the CB1R (CNR1; Hs00275634_m1), the 2-AG synthesising enzyme diacylglycerol lipase alpha (DAGLα, Hs00391374_m1), the 2-AG inactivating enzymes monoglyceride lipase (MGL, Hs00200752_m1) and abhydrolase domain containing 6 (ABHD6, Hs0097789_m1), the anandamide synthesizing enzyme N-acylphosphatidylethanolamine phospholipase D (NAPE-PLD, Hs00419593_m1) and the anandamide inactivating enzyme fatty acid amide hydrolase (FAAH, Hs00155015_m1). qPCR was performed with an ABI Prism 7900HT Fast real-time PCR system with a 384-well format. Measurements were performed in triplicate and relative quantities determined from a seven-point standard curve. Control wells containing no cDNA template displayed no amplification. Efficiencies of the qPCR reactions ranged from 80% to 100%, and r2 values were between 0.97 and 1.00. Outliers were excluded from qPCR analysis if their normalised expression values were greater than 2 standard deviations from the group mean. Expression levels were normalised to the geometric mean of four ‘housekeeper’ genes that did not change expression with development: hydroxymethylbilane synthase (HMBS, Hs00609297_m1), glucuronidase-b (GUSB, Hs99999908_m1), ubiquitin C (UBC, Hs00824723_m1) and cyclophilin A (PPIA, Hs99999904_m1) . A 247 bp fragment of the human CNR1 gene cDNA, corresponding to bps 937–1183, was inserted into a pCRII vector (Invitrogen, CA, USA). Antisense riboprobes and sense strand RNAs were generated from linearised plasmid using SP6 and T7 polymerases respectively and an in vitro transcription kit as recommended by the manufacturer (Promega, WI, USA). [35S] antisense and sense riboprobes were labelled to a specific activity of ~2 x 109 cpm/μg by addition of radiolabelled UTP and were purified by ethanol precipitation. 14-μm coronal sections of the middle frontal gyrus from the developmental cohort tissue were used (n = 56). In situ hybridisation histochemistry was performed as previously described , using two slides per case. After hybridisation and washing steps, sections were exposed to autoradiographic film (Bio-Max, Kodak) for 3 weeks. Sections were then dipped in photographic emulsion (Kodak, type II NTB) for 13 weeks and then developed and counterstained with thionine. All sections were assayed together to limit interassay variability. Calibrated densitometric analysis (ImageJ, National Institutes of Health, http://rsb.info.nih.gov/ij/) was conducted, blind to age, on Brodmann’s area 46 of the DLPFC delineated microscopically from adjacent Nissl-stained sections. For each section, three randomly placed lines (415 μm width) were drawn perpendicular to the pial surface, traversing the entire cortical grey matter. The density of CB1R mRNA as a function of cortical depth was computed from continuous optical density measurements recorded along the length of these lines, using radioactive standards for comparison (American Radiolabeled Chemicals Inc., MO, USA). The percentage of full cortical width corresponding to the individual lamina was determined from published guidelines as follows: I (2-6%), II (14-18%), III (20-42%), IV (46-50%), V (54-68%) and VI (72-92%) [86, 87]. Normalisation and analysis of microarray data were performed using R (http://www.r-project.org) and Bioconductor software (http://www.bioconductor.org), with which differential gene expression across chronological age was analysed using linear regression. The R program was used to draw regression lines of best fit depending on the profile of gene expression changes with age. qPCR and in situ hybridisation data were analysed using PASW Statistics 18 (SPSS Inc., IL, USA). Differences in normalised mRNA expression detected by qPCR were tested with one-way analysis of variance (ANOVA) with age group as the grouping variable in all analyses. Pearson’s correlation analyses were performed on normalised qPCR mRNA expression and demographic variables, and analysis of covariance (ANCOVA) was conducted where significant correlations were observed with pH, post-mortem interval (PMI) and RIN as continuous variables. Differences in optical density of CB1R mRNA detected by in situ hybridisation were tested with two-way repeated measures ANOVA with age group as the between-subjects variable and cortical layer as the within-subjects variable. Fisher’s least significant difference (LSD) post-hoc analyses were used to identify significant differences between age groups. Simple linear regression was performed to identify predictive relationships between normalised expression of CB1R mRNA detected by qPCR and interneuron marker mRNAs of interest that were previously measured in the same cohort . This work was supported by the Schizophrenia Research Institute, utilising infrastructure funding from New South Wales Health and the Macquarie Group Foundation, Neuroscience Research Australia and the University of New South Wales. We acknowledge the assistance of Dr H. Ronald Zielke and Robert Vigorito of the University of Maryland Brain and Tissue Bank for Developmental Disorders. We also thank Shan Yuan Tsai, Duncan Sinclair, Heng Woon and Stu Fillman for technical assistance and Jenny Wong for design of the template for the CB1R riboprobe, and Michael Elashoff for assistance with microarray analysis. CSW and LL contributed the design, execution, data analysis and interpretation of the study, JL conducted the in situ data analysis, and MJW provided neuroanatomical expertise, access to the tissue and provided comments on the manuscript. All authors read and approved the final manuscript.